Why Is Frozen Meat Fresher? 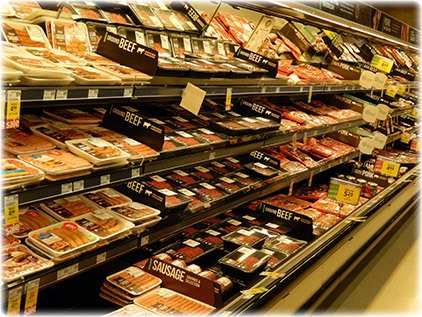 When people buy their meat from the grocery store it is often sold as "fresh" meaning unfrozen. But how "fresh" is it, really? First, the word "fresh" may not always mean what you think it does. When meat is sold as "fresh" in the grocery store the term can mean part-frozen, heat-treated, irradiated, or chemically altered and stored in refrigerated coolers for weeks or even months. Second, while grocery store meat may state when it was packaged, it does not usually state how long it has been in an unfrozen state. Oftentimes meat may be stored in refrigerated coolers for days or weeks before being packaged. As an example, when you buy lamb from the grocery store it often comes from New Zealand and is sold as "fresh" when in fact it may have been dead for two months, according to this article. Or, consider grocery store chicken. It might have been refrigerated at the slaughter-plant and then the grocery store for more than a week by the time you buy it and bring it home --- yet according to the CFIA, poultry should not be kept for more than three days in the refrigerator. Third, many grocery stores in Canada are reportedly altering the "best before date" by repackaging old meat, or grinding it and adding it to other meat, or marinating it to mask the "off" smell, or even dipping it in blood to make it look "fresher" --- according to a CBC Marketplace investigation and also a Radio Canada investigation. Fourth, because the so-called "fresh" meat in grocery stores has often been sitting in refrigerated coolers for days or even weeks, harmful bacteria can sometimes end up contaminating the meat without you even knowing it. According to a study published in the Journal of Clinical Infectious Diseases, almost half of all raw meat in US supermarkets analyzed contained antibiotic-resistant staph bacteria. Although the study was only carried out on US stores, it does not follow that Canadian grocery stores would have fared any better. Many of these problems which I've outlined above might have been avoided had the meat been quickly frozen when it was first processed. But grocery stores resist doing this because they think meat "sells better" when it is unfrozen because it is more visually appealing --- even if it is actually teeming with bacteria. Our goal is to help you, our friends, know that the so-called "fresh" meat being sold in the grocery stores may not be fresh at all. That's why we freeze all of our meat rapidly after it has been processed, to give you a healthy and beneficial product. All of our meat is vacuum-sealed and quickly frozen in order to preserve its freshness and give you the healthiest and most flavorful product we can provide.